THE 84th World Library and Information Congress, the first for Malaysia (after two other bids previously), will open in Kuala Lumpur from Aug 24-30. The theme "Transform Libraries, Transform Societies", with the sub-theme: "Reaching out to the hard to reach" – clearly points to the challenges ahead as libraries, like many knowledge-based organisations, face an uncertain future. 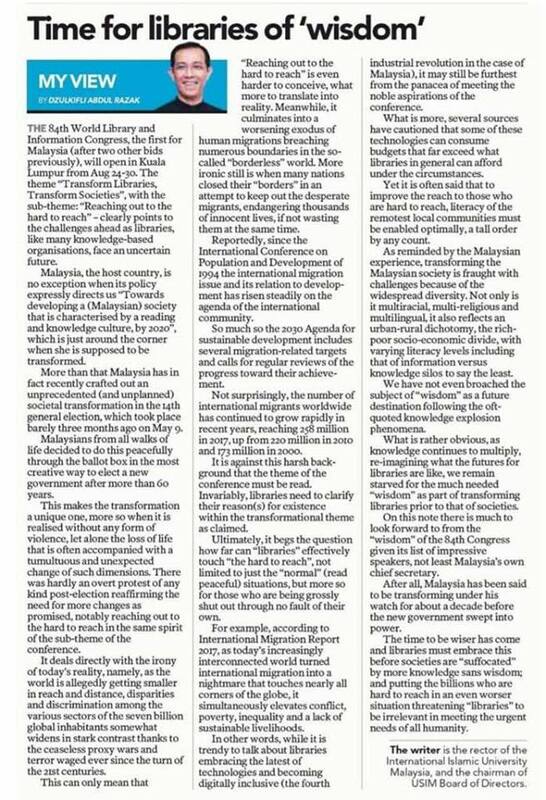 Malaysia, the host country, is no exception when its policy expressly directs us "Towards developing a (Malaysian) society that is characterised by a reading and knowledge culture, by 2020", which is just around the corner when she is supposed to be transformed. More than that Malaysia has in fact recently crafted out an unprecedented (and unplanned) societal transformation in the 14th General Election, which took place barely three months ago on May 9. Malaysians from all walks of life decided to do this peacefully through the ballot box in the most creative way to elect a new government after more than 60 years. This makes the transformation a unique one, more so when it is realised without any form of violence, let alone the loss of life that is often accompanied with a tumultuous and unexpected change of such dimensions. There was hardly an overt protest of any kind post-election reaffirming the need for more changes as promised, notably reaching out to the hard to reach in the same spirit of the sub-theme of the conference. It deals directly with the irony of today's reality, namely, as the world is allegedly getting smaller in reach and distance, disparities and discrimination among the various sectors of the seven billion global inhabitants somewhat widens in stark contrast thanks to the ceaseless proxy wars and terror waged ever since the turn of the 21st centuries. This can only mean that "Reaching out to the hard to reach" is even harder to conceive, what more to translate into reality. Meanwhile, it culminates into a worsening exodus of human migrations breaching numerous boundaries in the so-called "borderless" world. More ironic still is when many nations closed their "borders" in an attempt to keep out the desperate migrants, endangering thousands of innocent lives, if not wasting them at the same time. Reportedly, since the International Conference on Population and Development of 1994 the international migration issue and its relation to development has risen steadily on the agenda of the international community. So much so the 2030 Agenda for sustainable development includes several migration-related targets and calls for regular reviews of the progress toward their achievement. Not surprisingly, the number of international migrants worldwide has continued to grow rapidly in recent years, reaching 258 million in 2017, up from 220 million in 2010 and 173 million in 2000. It is against this harsh back-ground that the theme of the conference must be read. Invariably, libraries need to clarify their reason(s) for existence within the transformational theme as claimed. Ultimately, it begs the question how far can "libraries" effectively touch "the hard to reach", not limited to just the "normal" (read peaceful) situations, but more so for those who are being grossly shut out through no fault of their own. For example, according to International Migration Report 2017, as today's increasingly interconnected world turned international migration into a nightmare that touches nearly all corners of the globe, it simultaneously elevates conflict, poverty, inequality and a lack of sustainable livelihoods. In other words, while it is trendy to talk about libraries embracing the latest of technologies and becoming digitally inclusive (the fourth industrial revolution in the case of Malaysia), it may still be furthest from the panacea of meeting the noble aspirations of the conference. What is more, several sources have cautioned that some of these technologies can consume budgets that far exceed what libraries in general can afford under the circumstances. Yet it is often said that to improve the reach to those who are hard to reach, literacy of the remotest local communities must be enabled optimally, a tall order by any count. As reminded by the Malaysian experience, transforming the Malaysian society is fraught with challenges because of the widespread diversity. Not only is it multiracial, multi-religious and multilingual, it also reflects an urban-rural dichotomy, the rich-poor socio-economic divide, with varying literacy levels including that of information versus knowledge silos to say the least. We have not even broached the subject of "wisdom" as a future destination following the oft-quoted knowledge explosion phenomena. What is rather obvious, as knowledge continues to multiply, re-imagining what the futures for libraries are like, we remain starved for the much needed "wisdom" as part of transforming libraries prior to that of societies. On this note there is much to look forward to from the "wisdom" of the 84th Congress given its list of impressive speakers, not least Malaysia's own chief secretary. After all, Malaysia has been said to be transforming under his watch for about a decade before the new government swept into power. The time to be wiser has come and libraries must embrace this before societies are "suffocated" by more knowledge sans wisdom; and putting the billions who are hard to reach in an even worse situation threatening "libraries" to be irrelevant in meeting the urgent needs of all humanity. The writer is the rector of the International Islamic University Malaysia, and the chairman of USIM Board of Directors.